This was never likely to be a cautious tactical game but few expected one side to dominate so quickly and decisively as Chile did. Juan Antonio Pizzi’s team grabbed a two goal lead within the opening 11 minutes, stunning Colombia. Jose Pedro Fuenzalida created the opening goal with his speedy run down the right before delivering a dangerous deep cross towards Alexis Sanchez. Colombia winger Juan Cuadrado had run back to help out his defense and leapt above Arsenal forward Sanchez but his header was a poor one, towards goal and landing at the feet of Charles Aranguiz who slotted in from close range to open the scoring in just the seventh minute. Within four minutes it was 2-0. Sanchez turned brilliantly to lose his marker, cut inside and drilled a low shot against the foot of the post. The ball bounced out to Fuenzalida who made no mistake from close range to double the lead. Colombia knuckled down however and clawed their way back into the game. Striker Roger Martinez brought Chile goalkeeper Claudio Bravo into action in the 24th minute and the Barcelona keeper did well again to keep out a powerful long range drive from Carlos Sanchez with a superb diving save. For over two hours heavy thunderstorms buffeted Soldier Field with rain flowing down the stands and fans taking cover in the concourses while the lightning crashed down outside. It was past 10.30pm local time when the second half finally got under way and most of the fans were still there, singing and dancing as they waited to see if Colombia could turn the game around. When the game did get under way, it was clear the field was wet and heavy. Colombia will point to two decisions by referee Joel Aguilar of El Salvador early in the second half which severely limited their chances of a comeback. Colombia had a claim for a penalty rejected four minutes after the restart when Daniel Torres was brought down by a clumsy challenge from Gonzalo Jara. Then in the 57th minute Carlos Sanchez was dismissed after a second yellow for a late challenge on Aranguiz. It looked like the referee was a little too swift to draw a yellow card without realizing Sanchez was already on a yellow. Those who had hoped that Colombia would reproduce some of their sparkling performances from the World Cup two years ago were ultimately disappointed. The 2-0 win over the U.S. in the opening game was a solid performance and a 2-1 victory over Paraguay secured their place in the knockout phase. But Jose Pekerman’s team needed penalties to get past Peru in the quarter-final and never truly convinced in that game, before they were blitzed by Chile. Carlos Bacca’s presence was missed in attack in the semi but there can be little argument that the two best teams are in the final. Suspended Bayern Munich midfielder Arturo Vidal’s presence was obviously missed by Chile but he will be back for what is a re-match of last year’s Copa America final - won by Chile on penalties. It promises to be a great final in New Jersey with the brilliance of Messi and Co up against the high-speed attacks down the flanks from Chile. 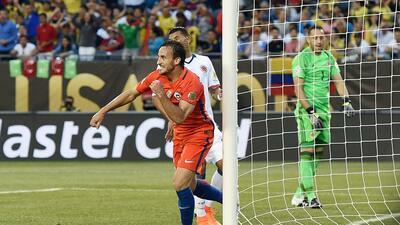 If Vidal and Alexis Sanchez are at their very best, Chile have a chance. But Argentina, the best team in the world at the moment, clearly start as favorites. Outside the Box is a Univision Copa America soccer blog by Simon Evans a British-born, Miami-based sports journalist who has covered every World Cup since 1998 and has worked across Europe and North America covering football for a number of international media outlets. He was the co-author of the ‘Rough Guide to European Football’ and his work has appeared in the Washington Post, the Guardian, Reuters and many other publications.